Maryland rockers CLUTCH have been forced to cancel tonight's (Saturday, October 27) concert at the Irving Plaza in New York City after singer Neil Fallon mysteriously passed out while out for a walk in Secaucus, New Jersey. Fallon explained the decision to scrap the show in a series of tweets. He wrote: "Regarding tonight's cancellation at Irving Plaza. It's me. Again. In the early afternoon I went for a stroll. I became light headed and dizzy. Next thing I knew I was coming to on my back in a puddle of water with 2 Secaucus policemen and paramedics staring down at me. "Apologies to all the folks who made plans to come to the show but the doc says no. Believe me, no one is more pissed about this than I. We'll be on tour for quite some time in 2019 and we'll certainly try to get an Irving Plaza date in there. 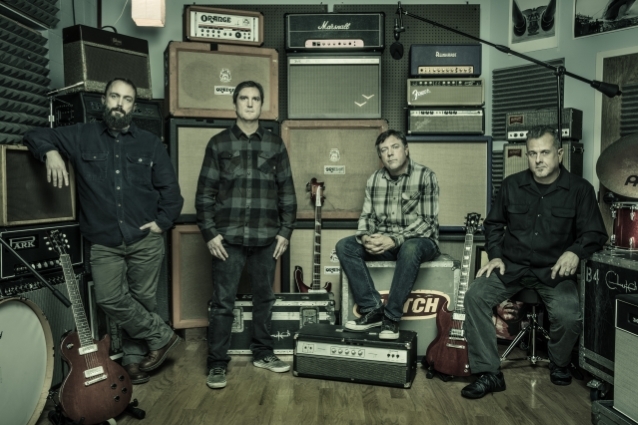 CLUTCH's latest album, "Book Of Bad Decisions", was released in September. The record sold 26,000 copies in America during its first week of availability, giving the group their third consecutive Top 20 album on the Billboard 200. CLUTCH's fall 2018 "Book Of Bad Decisions Tour" with support from SEVENDUST and TYLER BRYANT & THE SHAKEDOWN is scheduled to wrap up tomorrow (Sunday, October 28) in Philadelphia, Pennsylvania. Regarding tonight's cancellation at Irving Plaza. It's me. Again. In the early afternoon I went for a stroll. I became light headed and dizzy. Next thing I knew I was coming to on my back in a puddle of water with 2 Secaucus policemen and paramedics staring down at me.